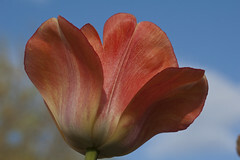 Today I'm sharing this beautiful orange Tulip photograph that I took at Cantigny Park in Wheaton, IL. They have beautiful gardens and in April it was all tulips. I really like the bright orange against the blue sky. What a pretty day that was. If you would like more information on Cantigny Park, visit their website at http://www.cantigny.org. great tulip! i've never been to cantigny park....i'll have to check it out. btw...love your abstract playground shot! I don't see many orange tulips so this is a treat. Fantastic photo, Diane.